Because what we consume can aggravate certain physical conditions, Dr. Brusveen finds it helpful to coach patients regarding their eating habits. Through honest doctor-patient dialogue and informational literature, he strives to educate each person concerning his or her individual health and wellness. Do you know which supplements and vitamins are good for you? Dr. Brusveen can provide a customized nutritional program based on your individual needs. 1) Do you get good nutrition? 2) Is your body able to absorb good nutrition? 3) Are you full of toxins? Dr. Brusveen provides specific recommendations on nutritional supplements and healthy food choices to enhance his patients’ return to optimal health. There are many choices when it comes to supplements, and not all are created equal. 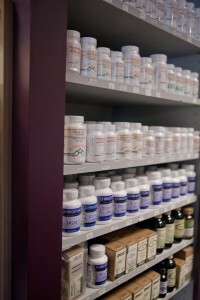 Dr. Brusveen spends many hours researching supplements and their quality. Your body deserves the best!